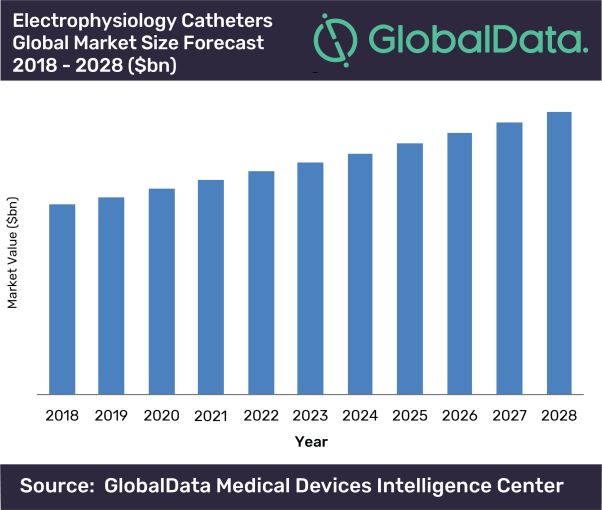 The global electrophysiology catheters market is expected to reach $3.9bn by 2028, growing at a compound annual growth rate (CAGR) of 4.1%, according to GlobalData, a leading data and analytics company. The company’s reports, ‘Electrophysiology Ablation Catheters – Cardiovascular Market Analysis and Forecast Model’ and ‘Electrophysiology Diagnostic Catheters – Cardiovascular Market Analysis and Forecast Model’ reveal that within electrophysiology diagnostic catheters, steerable catheters maintain the largest share in the market. However, while irrigated tip catheters have the largest share in the electrophysiology ablation catheters market, cryoablation catheters are the fastest growing segment, estimated to grow at a CAGR of 4.4% by 2028. Barriers to market growth, particularly in developing countries, include the high cost of building labs specifically for electrophysiology procedures, as well as training specialists to perform the procedure.